I have spent the weekend doing nothing. Which is great right? Well no, not if you attempting to start a business, run a successful blog or be a creative person, doing nothing is the opposite of a good weekend. I am attempting to do all of these things, so a weekend of doing nothing is, in fact, a failure, especially as I put in about 50 hours a week into my ‘day job’. So in an attempt to claw back some semblance of a productive weekend, I started to read Neil Gaiman’s ‘Make Good Art’ speech. The theory being that it might kick start me into doing something creative. Although some would say that this blog post wasn’t creative, I beg to differ. In today’s society, there are many mediums which would previously have been overlooked or brushed off which now fall under the creative banner. Blogging is one of those, but I started this blog in an attempt to get me writing on a more regular basis, the theory being that you need to write more to get better at writing. After this, I will move on to my own authory projects and in fact whilst writing this blog post, I have collaborated with my flatmate on the layout for one of our business websites and booked myself onto a course about getting finding an agent and a publisher, so more productive in this last two hours than the whole of the rest of the weekend combined. 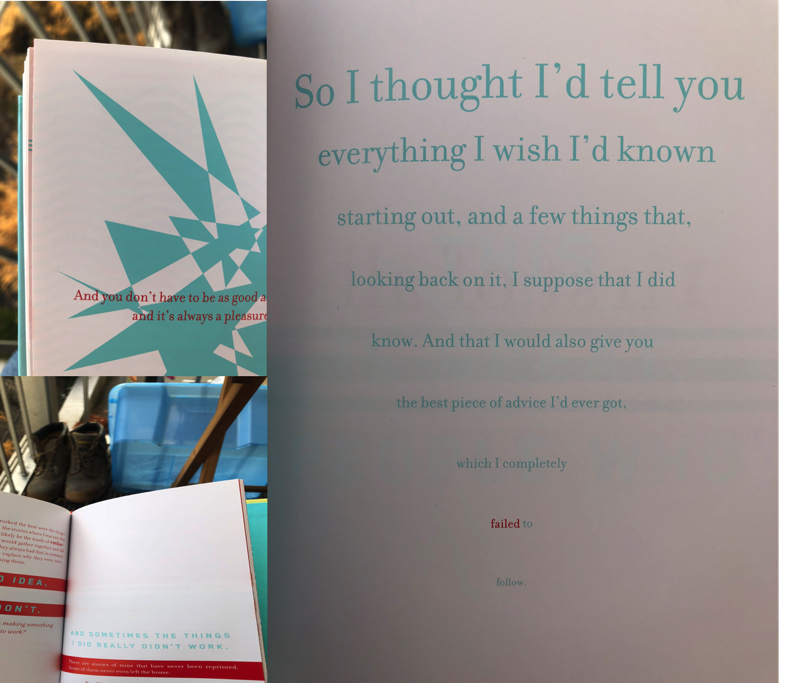 This book is actually pretty interesting, much apart from the title, the words and the meaning behind those words which make up the speech itself, because this book is a work of Art. 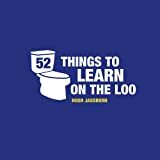 I used to work in a bookshop (I’m sure I’ve mentioned this before) and if this book had come into my store, I really would have struggled to work out where to put it. I think Neil Gaiman and Chip Kidd would be quite offended by this, to be honest. It is more in line with the essays of… collection by Penguin. But then even that is not quite right. 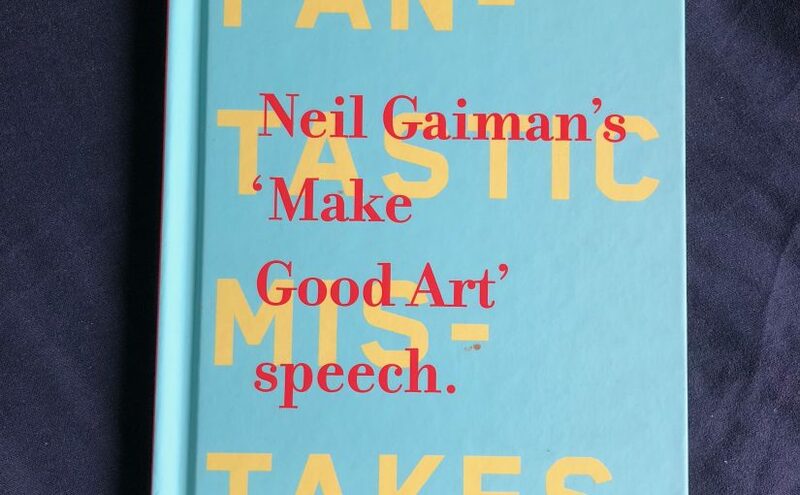 This book is a very visual interpretation of a speech about making good art which Neil Gaiman gave to Philadelphia’s University of the Arts students in May 2012. The visual side provided by Chip Kidd. And I have to say, it is full of good advice and statements which really do make you think about what it means to make art and who in fact you are making it for. So much so that, even though I am fairly certain that no one will actually read this blog post (I haven’t SEO’d the life out of it for a start) I am still writing it and putting it out into the big wide world for all to see. Which is exactly the point. Don’t make art for the money! Make the art you want to make and make it for you! So, if you don’t want to spend the £12.99 to purchase this speech turned into a work of art, then you are welcome to listen and watch the whole thing on Vimeo. Much like his wife, Amanda Palmer, Neil knows the benefits of giving away some of his work for free, he knows the worth of his fans and he knows how to encourage loyalty amongst them. Neil Gaiman is the critically acclaimed, award-winning, New York Times bestselling author of numerous novels, stories, graphic novels, children’s books, and screenplays. Originally from England, Gaiman now lives in the United States. He fears the Fraud Police. See below speech by Amanda Palmer on the definition of Fraud Police. Chip Kidd provides the graphics and design for this book. It certainly is a piece of art. Chip Kidd is a graphic designer and writer in New York City. He tries to make good art, but mostly just makes mistakes. Whether or not any of them are interesting, amazing, glorious, or fantastic is anyone’s guess. So, if you have a spare half hour and are looking for some inspiration, then I suggest you grab a copy and give it a read. 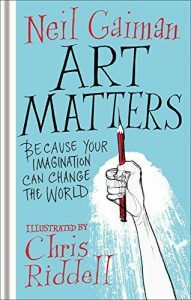 You can buy Neil Gaiman’s – Art Matters from Forbidden Planet.